Avoid the peak summer season (June-August) to be able to enjoy the islands without the crowds. We are comparing Murano, Burano and Torcello Day sightseeing tour Prices from leading ticket suppliers and Try to find you Cheap tickets prices on the market. 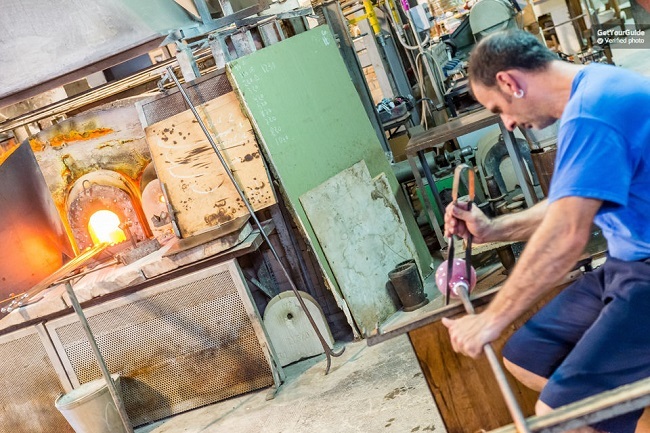 Murano is the island famous for its glass with traditional glass blowing still happening on the island to this day, a skilled trade that has been ongoing since the 10th century! Burano is known for its traditional lace making but even more so for its brightly coloured houses that line the inland waterways. Torcello is historically important, the most ancient of Venetian islands, it was the largest and most important centre long before the Republic of Venice was formed. This sparsely populated island has the Basilica di Santa Maria Assunta which contains impressive ancient mosaics. It also has the iconic Devil\'s Bridge and Attila\'s throne, all of which should be seen as you begin to understand a little about the history of all of these islands that make Venice so special and unique. A great half-day trip for people who are short on time and want to see as much as possible in as short a time as possible. A great way to buy traditional crafts plus see the items being made. An artist and photographer\'s dream come true – Burano particularly! Not good if you want to be able to explore at your leisure – 45minutes is not enough time to properly see these islands so you may wish to arrange your own itinerary. Your Experience With Murano, Burano and Torcello Day sightseeing tour? Board your boat at the designated time and leave the mainland of Venice behind as your English speaking guide shares information about what to expect from the day, and what you\'re passing whilst you delight in the views from the lagoon on the 40 minute journey. En route to the 1st island you\'ll be passing by San Giorgio Maggiore with its 16th-century church, the public gardens at the tip of Sant\'Elena, and the famous Lido beach resort. If travelling in the Summer season your first stop will be at Murano - The island famous for its glass. Here you\'ll be able to watch a free glass blowing demonstration and have some time for shopping. Alternatively, skip the glass blowing and use the extra time to see more of this picturesque island as you wander its streets and admire the glasswares. Back onboard, you\'ll have a short 15-20minute ride to the next island, the bright and beautiful Burano that\'s known for its lace makers and for its brightly painted houses. You\'ll be able to wander the streets for approximately 45 minutes, taking numerous photos, looking in the shops, perhaps stopping for a snack as you take in this world-famous place. The last stop of the day is at Torcello, another 15-20 minute ride on the boat. Here you\'ll have another 45 minutes of free time, you might choose to visit the church to see the mosaics, take photos of the Devil\'s Bridge or just sit in the square and relax as you soak up the atmosphere. After the last island visit you\'ll get your boat back to Venice, the journey taking 1-1.5 hours so you can sit back, relax, and smile at the jam-packed day you\'ve had! What Murano, Burano and Torcello Day sightseeing tour Includes? Return boat trip from Venice to Murano, Burano, and Torcello. 45 minutes on each island. Glass blowing demonstration on Murano. Commentary onboard the boat from a multilingual guide – Tours offered in Spanish, English, French, Italian or German. If you\'ve seen glass blowing before, skip the demo to enjoy more time wandering the streets and window shopping in Murano. Get off of the main tourist trail in Burano to explore the backstreets and see more picturesque brightly coloured houses but without the crowds. Travelers Reviews about Murano, Burano and Torcello Day sightseeing tour? Travellers talking about this tour on GetYourGuide, Viator, Ticketbar, and Trip Advisor have both positive and negative things to say about this tour – The main complaint simply being not enough time to fully enjoy the islands, people not realising that this tour is intended for people who are very limited on time and want a \'short taster\' of each island. People do report problems in finding the boat initially and having to ask as all boats look the same so do plan ahead and be at the meeting point in plenty of time. Most travellers say they thought the tour was reasonably priced and that the trip was a great introduction to the islands, but everyone wishes they could have had longer to explore! Plan to get to the meeting point early – It can take some time to locate the correct boat. Stock up on drinks and snacks for the journey. Varies depending on season and tour operator but usually departs from Riva degli Schiavoni or Piazzale Roma – Check booking email to confirm.